The swankier green that Austin glows. Coyotes suddenly burst into riotous laughter across the Colorado River. The one in Texas, anyway. 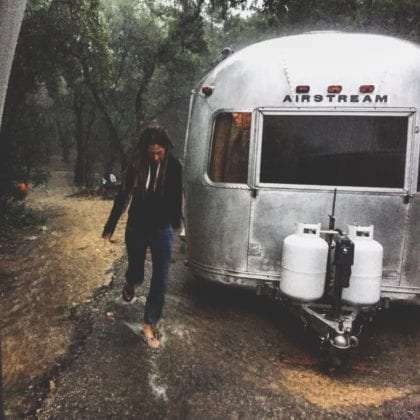 Torrential downpour nearly forced us from our last campsite as the Airstream got its lugnuts wet from a flash flood and tornados touching down only a few miles west. We pushed through, soaked but not sobbing and though our next plan fell through due to those same Texan floods wiping out the campground we’d planned to stay in for the week, we found solace elsewhere. Our neighbors pop top camper was two toned. The original white lined most of the top of the exterior. A neutral dirty gray, the color you might expect after waist high water, stained the bottom portion. 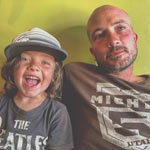 I believed them, though our kids are crazy loud. I wouldn’t have blamed them either way. We land in Emma Long City Park, in Austin’s city limits but surely the edge of it all. It’s not like a city here, and it’s not the manufactured community that is typical of just outside Austin. Rolling forested hills of ash juniper and a gambit of oaks fill the drive from our campsite to the nearest gas station. Mansions dimple those hillsides, or blemish them. I can’t be sure. It’s grandeur, rich excess in all of its wicked glory. But it’s also quite natural. They blend in with a world so unexpected this close to such a big city. The coyotes quiet. The sound of RVers watching Internet television hums and blurs together in between the choruses of crickets easing the night’s atmosphere. Earlier, speeding boats left the crash of their wake behind them as it licked up the shoreline. Our oldest son swam in it. Parties reveled into the night but sunset is around 5pm this time of year and by just before midnight everything is quiet. The river indiscernible save for a few reflected lights from unused weekend homes across the river. The sound of a hot water tank on a nearby neighboring RV cuts through the silence. And then I hear the crickets change tune to suit. Just a few thoughts of thanks to the things in my life that make it truly feel like living. Greetings from Big Bend, and more!